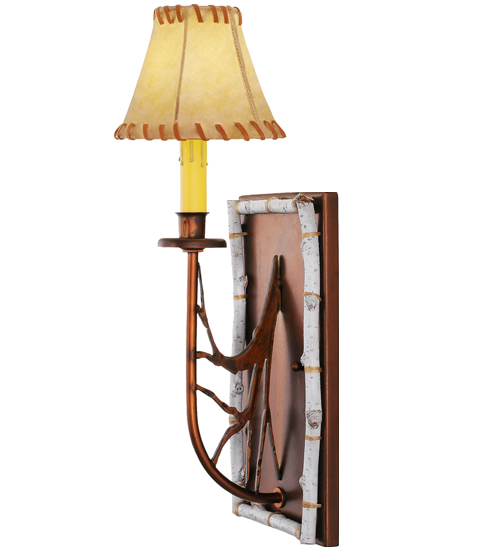 Description: An illuminating faux candlelight and leather shade appear to bud and grow from Natural Birch Bark hand harvested from low-hanging tree growth in the magnificent Adirondack Mountains. The hardware features metal branches with a ""bark texture"" and a stunning Vintage Copper finish. Custom crafted by Meyda artisans in our Yorkville, New York facility, fixtures like this are available in a wide variety of custom options including the size, style, color and energy-efficient lamping of your choice.